Tana lives in a world of fear. Vampirism is a spreading epidemic, and the infected are quarantined in “coldtowns.” People may enter coldtowns, but few ever leave. When Tana wakes in the aftermath of a bloodbath, she fears that she may be infected with the virus. She escapes with her infected ex-boyfriend and a mysterious vampire, and decides to head towards the nearest quarantined area. Along the way, she picks up an odd pair lured to Coldtown by the glamour of immortality. Tana turns in her vampire companion in exchange for a marker (a small token that allows a person to leave Coldtown) and enters the city. Her intention is to stay until she is sure she is not infected, but a twist of fate lands her in the heart of danger. She must rely on her wits and the help of new friends to survive in a city with no rules and a thirst for blood. This book has a very engaging storyline, although it does not have a lot of substance. The relationships between the characters are not particularly well-developed, and Tana’s romance with Gavriel seems forced. Their initial attraction is not at all apparent, and then all of a sudden they are passionately making out. Tana’s relationship with her ex-boyfriend Aiden is equally confusing, and the twins they pick up along the way to Coldtown are downright irritating. 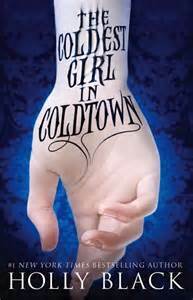 The concept of Coldtowns is in itself very interesting. Black cleverly links her post-apocalyptic setting to modern technologies such as live streaming feeds and internet blogs. This makes the setting far more believable and relatable to today’s teens. With the current popularity of reality tv shows and social media, it seems likely that this is exactly what would occur should such an outbreak be quarantined inside walled towns. Today’s culture has a certain fascination with morbidity, and reckless decisions made by teens willingly entering Coldtowns are highly plausible. Tana has escaped death twice. Has her luck finally run out? According to the author’s website, “Holly Black is the bestselling author of contemporary fantasy novels for teens and children. She grew up in New Jersey and loved reading and writing from an early age. Her first book, Tithe: A Modern Faerie Tale, was published in 2002. Talk about reality tv and blogging and relate it back to the characters in the book.